Just east of Bologna is Budrio, once the centre of hemp production on the plains but really better known for its great contribution to music; here, in 1853, Giuseppe Donati took what had been a toy and invented the ocarina ('little goose' in the Bolognese dialect). People once took ocarinas more seriously; in the 19th century composers wrote sonatas for them. They are certainly still revered in Budrio; there’s even a Museo dell'Ocarina Franco Ferri at Via Garibaldi 35 (+39 051 692 8306; open Oct-10 Jun Sun 3.30–6.30pm, also 10am–12.30pm first Sun of the month, or by appointment during office hours), if you ever wanted to buy a proper one in terracotta, this is the place. 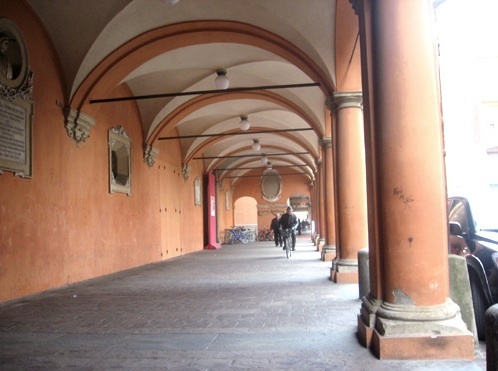 In the Palazzo della Partecipanza at Via Mentana 32, the Pinacoteca Civica (same tel and hours), has a surprisingly good collection including works by Vitale da Bologna, Dosso Dossi and Lavinia Fontana, as well as a room of rare books and atlases and another of archaeological finds. Budrio has more than its share of Baroque churches and paintings, but the one most worth seeing is just west of town, SS Gervasio e Protasio, where the Baroque façade conceals one of the oldest churches in the region, with a Romanesque interior that has decorative bits going back to the time of the Lombards. Three kilometres to the west at the frazione Bagnarola is an agglomeration of villas of the Bolognese élite from the 16th–19th centuries, nicknamed the ‘Bolognese Versailles’. East of Budrio the empty spaces are empty indeed; near the village of Medicina, if you see something that looks like the head of a garden rake but 500ft long, it’s only Bologna University’s radio telescope, the Croce del Nord. On the road from Budrio to Bologna, the name of Castenaso has for over 2,000 years kept alive the memory of the mighty Roman nose of Publius Scipio ‘Nasica’, a general otherwise famous for defeating the local Celts in the 2nd century BC.